Ancient Pompeii must have been something to behold. The ruins at Pompeii are truly amazing. 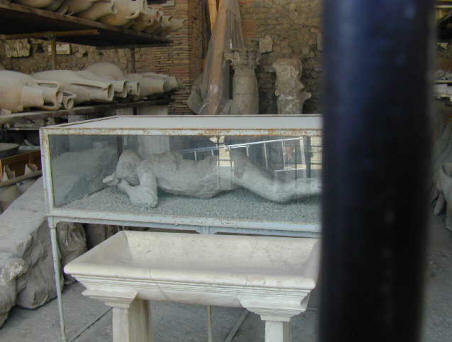 And I'm not talking about the plaster casts of the dead people and animals that are the trademark of Pompeii so-to-speak. 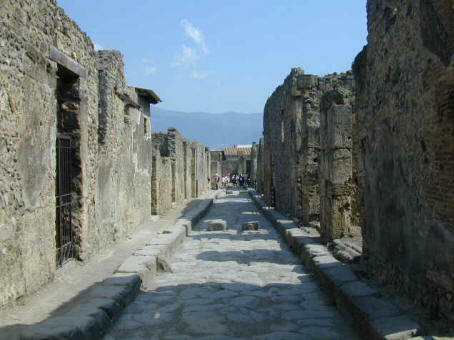 Pompeii has public baths, public fountains, and bakery's with brick ovens. There are deep ruts in the streets from the chariot wheels. In those days the streets were full of raw sewage, and every so often you can see very tall stepping stones leading across the street and the side walks are very tall as well. This is so you did not have to walk in raw sewage. Street scene in Pompeii... see those stepping stones? 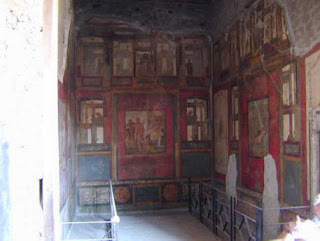 The inside of one of the rooms of a wealthy man's home in Pompeii - Beautiful fresco's on the walls. 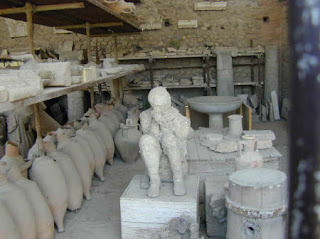 The trip to Pompeii was definitely one of the best shore excursion I've been on. There is a bit of walking, but hey... I can still walk at this point.